Interventional maneuvers to relieve shoulder impaction may be required to ensure a successful delivery. Simulation training has been shown to help both mother and fetus in the event of a shoulder dystocia birth. Obstetrical emergencies, such as shoulder dystocia, pose a huge challenge to the accomplishment of these objectives. However, hands-on training, complemented by repeated skills practice with simulation, can heighten the potential for positive outcomes in real-life situations. Many of the skills and maneuvers that may be necessary to relieve shoulder dystocia are best learned by direct experience (as opposed to observation-based learning). Simulation-based training may provide the best opportunity for healthcare workers to experience this obstetric emergency scenario without risk to actual patients. Fortunately, growing evidence supports simulation-based medical education as having a direct and positive affect on individual and medical team performance. Though the incidence of dystocia during childbirth is relatively infrequent1, when it does occur, there is great potential for adverse and, possibly, fatal consequences. 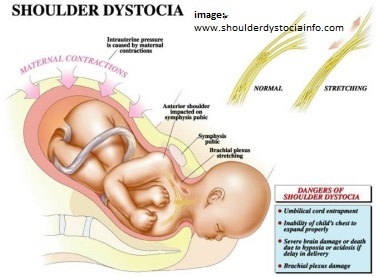 Shoulder dystocia results when the fetal shoulder rotates into the anterior-posterior diameter, impacting above the pubic bones and before entering the true pelvis. The shoulder may also become impacted on the sacral promontory. Expertly performed intervening maneuvers to relieve the shoulder impaction are required to ensure a successful delivery and minimize fetal injury, paralysis, asphyxia, or worse. Simulation-based training has been demonstrated to improve the management of shoulder dystocia. One study has shown that delivery of the impacted shoulder improved from 42.9% to 83.3% after simulation training. Permanent fetal injury risk, including brachial plexus injury, can be mitigated when properly-trained medical personnel perform necessary maneuvers in a calm, logical and well-coordinated fashion. And, since many of the technical skills and maneuvers for relieving shoulder dystocia are best learned by direct experience (as opposed to observation-based learning only), simulation can offer specific benefit to the attainment of procedural mastery and competency. CAE Healthcare built its high fidelity maternal fetal childbirth simulator, Lucina, to provide training in a range of delivery scenarios. Lucina is the only birthing simulator with validated maternal-fetal physiology that mimics human response to medical conditions and clinical interventions, giving learners a consistently objective experience every time, until they master the skills necessary to save a human life. Designed for a number of obstetrical emergency scenarios, including shoulder dystocia management, the CAE Fidelis Lucina birthing simulator is equipped with an observable pelvic tilt, as well as automatic detection and response to emergency delivery maneuvers. Discover More! Experience the Lucina Difference!